If you get the reference, you’ll know why this is so very perfect! 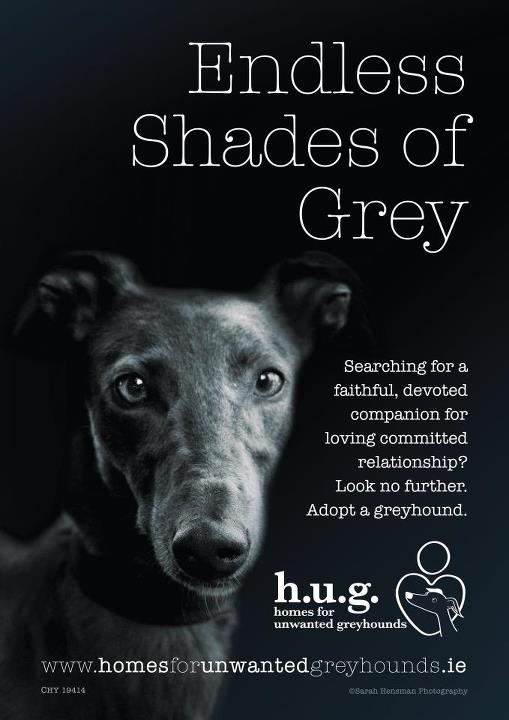 This is even more special to me because it was designed by my friend CanuckHound for the greyhound rescue she volunteers for here in Ireland, H.U.G. Greys are treated terribly around the world, and Ireland has more than it’s share of unwanted greyhounds. Believe me, these dogs are just big, elegant cats. Sleep 99% of the time, run around like a crazy thing for a few minutes, and back to sleep again. Quiet, not big shedders, the worst you can say about a grey is that their teeth need a lot of maintenance and they need big, floofy pillows (or your couch!) to sleep on. If ever a rescue dog is an option for you, please consider a retired or unwanted (sometimes they never have raced) greyhound! And if you love the advertisement as much as I do, please share! H.U.G. will even email you a copy. Greyhounds are beautiful! I hope things will get better for them. I love this! And at last, that book (*shudder* – apologies if you like it…!) can be used for good things! I know a very lovely rescue greyhound and he has definitely made me consider adopting one in the future. They’re wonderful dogs. They sound like great dogs to have. Greyhounds are the sweetest dogs. We have a very active rescue group here – there’s a dog track nearby.